Any lovers of comedy improv out there? Maybe you know the concept of word association (or A thru C) – the technique improvisors use when a suggestion is shouted from the audience. If anyone here has ever gone to ASSSSCAT 3000, a popular show at he Upright Citizens Brigade Theater in New York (where I studied a few levels of improv) and L.A. – you know the drill. Someone shouts out a suggestion, and a monologist takes it, thinks of what it reminds them of and breaks it down with story telling, allowing the group of improvisors to capture elements of a story to create totally out of the blue scenes. This is how I write on days when my day job is out of control, and I just need to convert my thoughts through the creative portal to my fingertips so I can write. I look at interesting items on the web or ideas that come into my head and do an A thru C: Where This…reminds me of This…which brings me to This…which starts a story based on what I’ve whittled down from that idea. So…The internet universe has given me a suggestion – The New Yorker cartoon you see before you. And here I go. 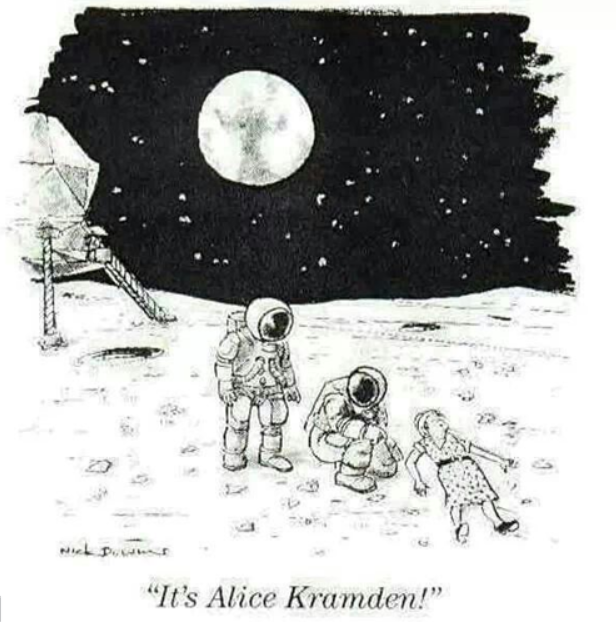 Alice Kramden reminds me of “Bang, Zoom” the comment Ralph Kramden would shout on The Honeymooners to Alice when she really burned him. This reminds me of old timely television, black and white with a dial you had to get up and turn in order to get one of the seven channels available for viewing. Pre-cable. Pre-satellite. Pre-DVR. Pre-Streaming. Pre-anything. Okay – maybe not pre-anything. There was FM radio back then, after all. It reminds me of the old basement in our old house in Ardsley, New York – fully furnished with a mid-century flair (as we now know it), some old furniture, a bar for cocktails and the lingering smell of mildew. It’s where I watched old re-runs of The Honeymooners with my dad on a Zenith color television that resembled a piece of furniture. It’s likely my father purchased it back in the early 60’s long before I was born because there was never time before 1983 that it didn’t exist in my life. That old wooden thing with the dial and the coffee ring stains and the rough speaker cover with straw and silver threads was a mainstay in our household. It was the kind of old television that would blow a bulb (just like a lamp would blow a light bulb), meaning my dad who have to take it to our backyard neighbor – who happened to be a television repairman – to replace it. As television advanced, and cable television gave humans more choice to fry their brains on any given night, my dad was hesitant to let go of the old Zenith. It cranked out a lot of hours of reruns of the Honeymooners, or original airings of CBS Saturday night shows like All in The Family, The Jeffersons, The Mary Tyler Moore Show (I still feel the cool chill of the basement when I hear the first moments of “Love is All Around”), The Bob Newhart Show or Carol Burnett. After a while, I defied my 11pm Saturday bedtime and snuck out of bed to watch Saturday Night Live to laugh at John Belushi flipping burgers (“cheeze boiger!”) and marvel at Gilda Radner’s character creations, Lisa Loopner and Rosanne Rosanna Danna. I remember watching that TV one evening in 1982 when a special report broke into regular programing to announce Belushi was found dead at the Chateau Marmont in Hollywood. Damn. John Lennon had died only two years before. It was rough to see another bad boy John leave the planet. When Beatle John died, I was devastated. When SNL John died, I was really pissed off. The television set and the basement reminds me of Saturday afternoons watching The Wonderful World of Disney and NY Mets baseball. I can’t remember what I saw during the Disney hour, but I remember the lull of the Shea crowd putting me to sleep. I can remember the days when my dad still smoked cigarettes in a red pack that were not Marlboro. To me, the smell of the sixties (which I barely remember) and the seventies is a mixture of cigarettes and toast – old car smell that has the fragrance of a thousand old smokes permeated in the threads. It’s not a bad aroma. In fact, it’s a comforting one. Although my dad quit the habit when I was still quite young, I can still see the swirl of the smoke streaming from the smoldering cigarette waiting in the ashtray as he took out his guitar to play House of the Rising Sun or his favorite Spanish classical piece Romanza. But it all comes back to the television. As we entered the eighties, and that old TV set started to lose color, contrast, horizontal and vertical strength, I pleaded with my dad to get a new one. Finally, finally – he broke down and purchase a brand new color set (now long since thrown out) to replace the old Zenith. “Why, why do you want to hold on to that old television”? I asked him the day before he walked into Crazy Eddie’s to buy that brand new fancy one. He must have heard Ralph Kramden say that a million times on that old television. And then he watched a man actually walk on the moon. Yeah. That television was a keeper. Sorry dad. Categories: As Seen on Television, Dads | Tags: ASSSSCAT, SNL, Television, The Honeymooners, Upright Citizens Brigade, Word Association | Permalink. This is a well written piece. I like the way that you circled around the television set and had new information each time and another angle looking at your father. Thanks, Allan! It was one of those off the cuff kind of posts that I needed to write on a day when I couldn’t really focus on writing. And sometimes- those are the best ones. Also – loving your blog, and plan to read your posts on the GG Bridge.